Liverpool had the better of the first half in their clash with Chelsea on Sunday, but Ruben Loftus-Cheek added a touch of class to proceedings. The hosts were dominant throughout the opening 45 minutes, creating the best chances of the game while Chelsea were limited to one or two dangerous counter-attacks. In turn, Jurgen Klopp will be pleased with what he saw from his side, but ultimately he’ll hope that they can find an all-important breakthrough to respond after Manchester City’s win earlier in the day. As for Chelsea, they need a positive result in the battle for a top-four finish, and so Maurizio Sarri will need to see more from his players to take control of the encounter. 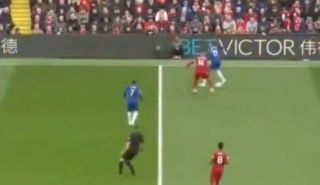 However, there was one highlight from the first half from a Chelsea perspective, and it was this delightful nutmeg flick from Loftus-Cheek on Henderson, as seen in the video below. The 23-year-old is getting a run of games from Sarri, and while these moments are great on the eye, he’ll hope to have a decisive impact in the second half for the Blues.